In Quebec, every child in a motor vehicle must be in a car restraint that is appropriate for the child's height and weight until the child reaches a sitting height of 63 cm. All car seats sold in Canada must meet Transport Canada approved standards and display a Transport Canada compliance label. It is illegal to use a car seat purchased in another country. Infants should always be installed rear facing in the back seat of the vehicle. The seat should be installed at a 45˚ angle. Even if your child weighs 10kg (22lbs) and is walking unassisted, keep your child in the rear facing position until your child outgrows the car seat. Rear facing is the safest position, even if your child’s feet touch the back of the vehicle’s seat. 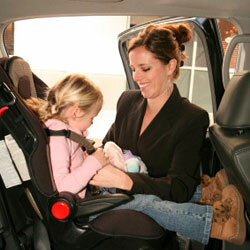 Keep your child in a forward facing car seat with a 5 point harness until your child outgrows the seat. Even if your child reaches 18 kg (40lbs) and is legally allowed to use a booster seat, your child is safer in a forward facing car seat as long as he or she still fits in it correctly. The purpose of the booster seat is to ensure that the seat belt is correctly positioned across the child's shoulder and lap. The shoulder belt must cross over the middle of the collarbone and the lap belt must cross over the hips, not the abdomen. A booster seat is needed when your child’s sitting height is less than 63cm. Child’s sitting height must be greater than 63cm. The child’s knees should bend over the seat. The Quebec permanent provincial verification network ensures that anyone in Quebec can have their car seat installation verified by a certified person. The list is available on the CAA-Quebec website. Children under 12 should always sit in the back seat. Verify and Respect car seat expiry date. Replace the car seat if the vehicle was in a collision, even if the child was not in the seat at the time. In the summer, the temperature in the car can rise quickly causing heat exhaustion and even death. In the winter, the exhaust pipe can become blocked by snow, and idling can cause carbon monoxide (CO) poisoning.